When the temperature drops below freezing and you switch on your furnace for the first time that season, a gust of cold air can be a nasty shock. While furnaces represent a predominantly reliable way to keep your home warm through the winter months, even a small problem can require professional attention and require furnace repair. Don’t wait around shivering-call Bill’s Heating & Air Conditioning for expert furnace repair in Lincoln. You can fix many minor furnace issues yourself by performing necessary annual maintenance or having an expert maintain the system for you. Regular cleanings and system checks prevent most furnace issues. However, when you need furnace repair in your Lincoln home, you need the knowledge and experience of our team. If you notice the smell of natural gas around your gas furnace, contact us right away. Then, turn off the gas supply valve, leave your home, and call your utility company. After we do a thorough inspection, We’ll let you know when the danger has passed. We know that by the time you contact an furnace repair expert, your home has probably become uncomfortably chilly. Usually that is not a problem for you unless it is frigidly cold outside or someone in the house is very old or very young. While we take care of your furnace issue, if you can, it’s best to find a warm place to be. Extra coats and blankets will be needed only until we can get your system back on line. Lincoln is known for out cold weather winters. We recommend at the first sign that something may be wrong with your furnace, that you contact us. Until we assess the situation, we won’t know how long it will take to repair or if a replacement is necessary. Losing heat in low temperature situations is never comfortable and you can take precautions by getting your equipment inspected in the fall or as soon as possible. We all know that equipment of any kind always seems to fail at the most inconvenient times. Are you expecting company over the holidays? Are you sure the furnace is reliable ? Let us perform a Furnace Service for you. Call and make an appointment today or request service through our online form. 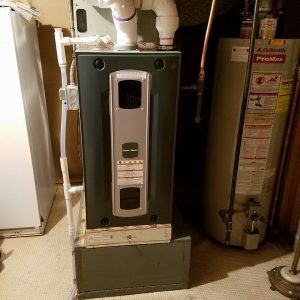 We are an excellent choice for Furnace Repair in Lincoln! For almost seven decades, our family-owned and -operated business has helped home and business owners like you keep their property safe and warm. While you’re here on our site, you may want to take advantage of our online service offer! When you choose to have us complete your furnace repair , we credit the $79 system analysis back to you! Having trouble heating your home? Don’t wait. Reach and schedule our dependable team for your furnace repair today by calling (402) 477-1371.